At Rosanjin Tribeca, our vision was inspired by one of Japan's most celebrated food connoisseurs and artists, Rosanjin Kitaoji. Rosanjin revolutionized the idea of Japanese cuisine and achieved his lifetime quest for beauty and art through food. Today our own dedication to food, like Rosanjin's to art, encompasses the aesthetic essence of Japanese culture and cuisine. We have transported the beautiful Japanese tradition of kaiseki, "the art of food," to Tribeca to create an elegant experience centered on first class cuisine. At its core, kaiseki is a celebration involving extraordinary attention to detail in every aspect of the dining experience. For this reason, and to provide impeccable and thorough service, our restaurant consists of only 9 tables. Just like the artist Rosanjin, we are dedicated to giving the utmost care to the process of kaiseki. Every dish is intimately designed to stimulate the senses. Starting with the cuisine, our major ingredients are directly flown in from Japan each day. In addition, we take advantage of seasonally fresh local fish and quality produce, carefully chosen when available. This combination of ingredients combines to create a perfect balance of taste, texture, and aroma. Every meal is decorated on precious porcelain and lacquer wear imported from Japan. The porcelain acts as a "kimono" for each dish, making it visually and aesthetically pleasing. Our servers then carefully present each course to you, culminating in an authentic kaiseki experience. 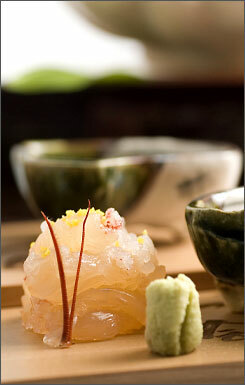 All of our kaiseki courses can be complimented with sake pairing. You can enjoy our selection of our sakes which are imported from various prefectures in Japan. We invite you to join us for your next dining experience as you celebrate the art of food at Rosanjin Tribeca.